GOLD PRICES held tight at this week’s opening level on Thursday in London, trading at $1317 per ounce as the rebound in Western stock markets stalled and the leadership race for both the UK’s ruling and opposition political parties grew yet more fractious. The US Dollar and Japanese Yen eased further back however from last week’s ‘safe haven’ surge following the UK’s shock Brexit vote. Major government bond prices also eased, edging 10-year US Treasury yields up to 1.50% per annum from this week’s new 4-year lows. The British Pound meantime continued to edge higher on the FX market, but held 10% down from this time last week. 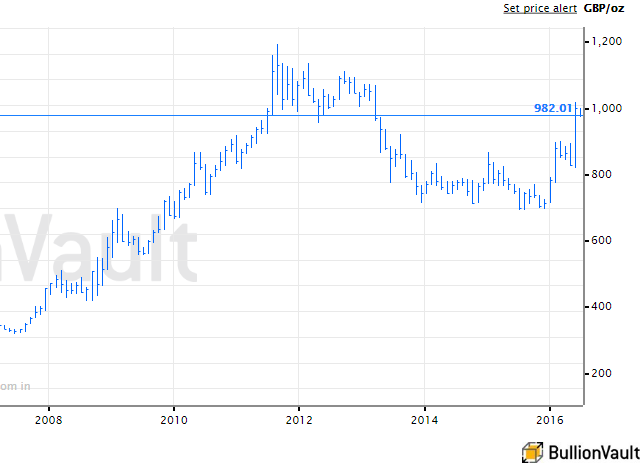 Gold prices for UK investors held above £980 – a level first seen 5 years ago this week, barely two months before gold’s all-time Sterling price peak some 21% higher. With Britain’s political leadership in turmoil after the Brexit result, “Sterling’s [small] gains do not appear to reflect fundamental developments,” says Chandler. Five MPs today threw their hat into the ring to replace current Conservative Party leader and UK prime minister David Cameron. Political betting moved to make Home Secretary Theresa May the odds-on favorite for both the Tory and government leadership. Britain’s opposition Labour Party meantime saw former minister Angela Eagle declare she will stand against current leader Jeremy Corbyn, who lost a vote of no confidence amongst parliamentary colleagues by a landslide on Tuesday. British MPs attending the House of Commons today discussed Twitter comments made last week by US actress and celebrity Lindsay Lohan. “A number of commentators have sought to reassure investors that the events of last week were not ‘a Lehman moment’,” writes Geoff Candy at investment professionals’ site Portfolio Adviser today, “[because] Brexit is not a financial event” but a political move. Brexit has “unleashed” a crisis of asset-price falls and deflation, legendary speculator George Soros today told the European Parliament in Brussels. Commodity prices, however, are set to end June with the largest quarterly rise since 2010, gaining 13% on average according to the Bloomberg Commodity Index but still halving their peak of 2011. Britain’s largest bank, bullion market maker and vault operator HSBC, meantime confirmed its headquarters will stay in London on Thursday, repeating a decision taken in February.